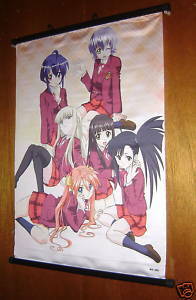 Up for sale is the wallscroll pictured. What you see is what you will be receiving. It measures about 17 inches wide and 24 inches long. This wall scroll is new and unused. This scroll will be mailed in a high quality mailing tube to ensure that it does not arrive crushed or damaged. Save with combined shipping when you buy this wall scroll along with any of the other 300 wall scrolls available in my store. Shipping I take great care in shipping ALL of my packages. I ship at least twice a week. This item is being sent via the USPS. USA: S H is 6.00 . Delivery Confirmation is included at no extra charge. You can ask for a tracking number if you have not received your item 7 days after I notify you of shipment. CANADA: S H is 6.00 for air mail. INTERNATIONAL: S H is 10.00 for air mail. International buyers rest assured when buying. I have been selling around the world since 1999 and I have had hundreds of happy buyers. Please make sure your country allows these items to be imported. I DO NOT LIE ON CUSTOMS FORMS. This item is NOT a gift. Please be aware that your country may charge you an import duty. To help, I do not include an invoice with your order and for used items I try to mark them as used. How long will this take to arrive by mail? I ship at least twice a week which means it may take from 0 to 3 days for me to mail your item after you pay. I will send an e-mail to the address you have on file with notifying you that the item has been shipped. Some packages arrive faster than others. It all depends on where the trucks are, when cargo planes are departing and perhaps the alignment of the planets. Please be patient! U.S. packages sent via First Class Mail take 3-6 days usually. Parcel Post packages usually take 4-10 days. Priority Mail is advertised as 2-3 days but has taken 4 before. Media Mail is super slow! Media Mail can take 3 days or 3 weeks. International packages sent via First Class Mail International (air mail) can take 2-6 weeks. Priority Mail International is usually 6-10 days but can take longer depending on location. Express Mail International is usually 1 week but can take longer depending on your location. Customs offices can create more delays for your items. Combined Shipping Contact Me The best way to contact me is through mail(Ask Seller a Question). I try to respond to all questions within 48 hours. View my other items and browse my for more great deals! Thank you for looking. :) Powered by Turbo Lister The free listing tool. List your items fast and easy and manage your active items.